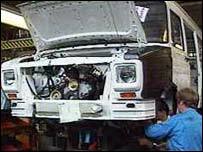 LDV, one of the last surviving UK-owned vehicle manufacturers, has agreed a rescue deal to save the troubled firm. Under the terms of the deal, the existing company has been put into administration and immediately bought by a private equity group. The new owners, a consortium led by the investment firm Sun European Partners, will retain LDV's 1,200 workers. The deal will ensure production at the group's Birmingham plant, although the fate of pensions rights is unclear. News of the deal was welcomed as "great news" by the Transport & General Workers' Union (T&G) which represents many of the group's workers. "Management, Government and unions have worked tirelessly to help the company during obviously difficult times," said T&G chief Tony Woodley. "LDV is a good modern plant managed by good people with a good product and a good workforce. "They deserve the future that has hopefully been secured by this arrangement," he added. 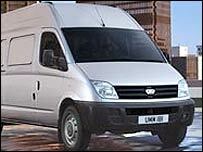 LDV - made famous by its Sherpa van - manufactures panel vans and minibuses. It was born in 1993 through a management buyout from truck maker Leyland DAF, which is now defunct. Just over a decade later, the company was refinanced through a partnership between European Acquisitions Capital and Barings England Growth Fund - teaming up with 3i, its original private equity partner. The firm's most popular vehicle is the Maxus, which has won several awards. LDV recently won an order for 250 of the vans from the Post Office. Launched earlier this year, Maxus became the third biggest selling heavy van in the UK in October, behind the Ford Transit and Mercedes Sprinter. It currently manufactures about 12,000 vehicles a year at its Washwood Heath factory in Birmingham, close to the M6 motorway. Next year it hopes to ramp up production to 14,000 to 15,000 as two new Maxus models go into production. Originally it had planned to start production of the new models towards the end of 2006, but if the latest refinancing deal goes through the company will be able to bring forward production by six months. Ten days ago, LDV had to suspend production of its vans and send workers home, fuelling fears of a cash crisis. However, at the time the company said it had shut down productions in order to "rebalance stocks".